This night the sky was very stable here in Leipzig. I pointed my 4 inch refractor at Mars. It was one of the best observations of that season. I tried not to exaggerate the contrast. Did Mars truly appear to have that shape, due perhaps to atmospheric distortion? 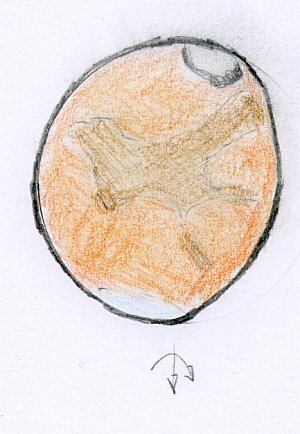 Nice sketch of Mars (On November 9th) . That is a fine sketch of Mars, all the better for making it at the eyepiece of a 4 inch refractor.